Studies show that children who learn a second language also develop a larger vocabulary and a better understanding of the structural and grammatical rules of their first language. With Brighter Child Spanish Grade 2, you can help your child acquire the Spanish speaking, reading, and listening skills that will make him or her more successful in the school years ahead. 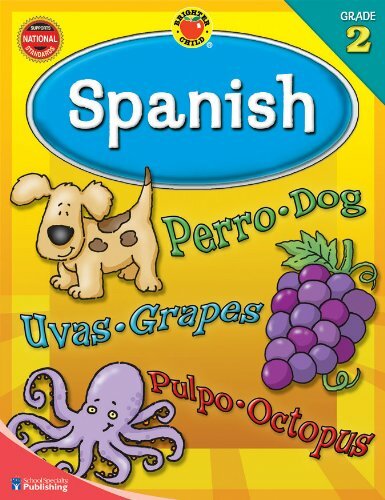 Offering 80 pages of full-color activities, easy-to-follow directions and complete answer key, children will have fun learning a second language. Features activities that teach: *Spanish number, color, food, animal, clothing, family, classroom, & place words *Spanish alphabet *Nouns, verbs, & adjectives *First sentences *Spanish introductions & greetings *Spanish words for the days of the week and months of the year *Listening skills *Spanish songs & chants The popular Brighter Child Workbook series offers a full complement of instruction, activities, and information in 51 subject-specific workbooks. Encompassing preschool to grade 6, this series covers key subjects including basic skills, English & grammar, math, phonics, reading, science, and Spanish. This series is helping prepare children by giving them a solid foundation in key skills necessary for success in the classroom!